Wow, it was a glorious day in East Tennessee today. Sunny blue skies and 70+ degrees, hard to believe it is still winter. But the LACK of fresh herbs in my front yard reminds me, yes, it is still winter, dude. 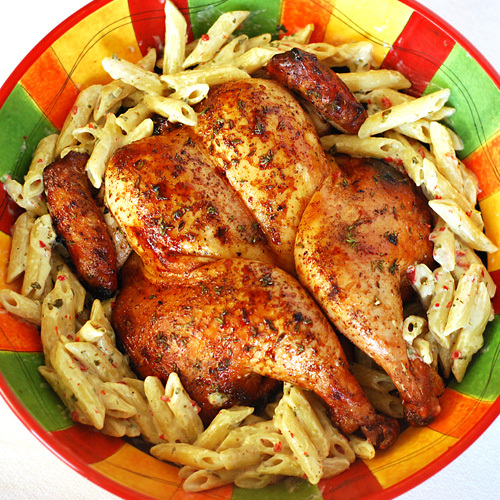 Here is the pasta recipe that went with the chicken the other day. Since I don't have any fresh basil, I used Gourmet Garden's Basil Herb blend. I never tried it before but tasting it straight from the tube, it is not as good as fresh but it is 10 times better than dried basil. I learned something while making this dish. If you try to say "shallot and garlic" and stumble over your tongue, it becomes "Charlotte". In a preheated saute pan over medium high heat, melt the butter and saute the shallot and garlic 2-3 minutes. Add the flour, stirring continuously to form a blond roux. Whisk in cream and simmer until slightly thickened, about 5 minutes. Add the basil and red bell pepper. Use the pasta water as needed to think the sauce. Toss the pasta in with the cream sauce and serve. According to the package, 1 Tbsp of basil paste = 1 Tbsp of chopped fresh basil, so when it's Summer again and fresh basil is growing in your yard, you can just use 1/4 cup of fresh basil. Anyone else have the urge to go walk barefoot in grass? [Standard Disclaimer] I paid full price for the basil paste and have no affiliation with Gourmet Garden.